Google has changed a lot in the last decade. It is now way more a semantic engine than it was back than. What has changed? Let’s get started from a key algorithm change: RankBrain. What is RankBrain why it matters? What does that mean for SEO? Is traditional SEO dead? How does SEO change in this context? Do you want to skip the line? Target the featured snippet! Featured snippet vs. knowledge panel: Who’s the winner? Google RankBrain is a machine-learning system integrated within a Google algorithm update called Hummingbird. This Google system is able to better serve search results to users based on their intent, rather than just keyword matching. It’s hard to realize how complex and sophisticated is the Google search algorithm just because it works so marvelously well that it seems natural it does so. Yet before we got there, it took almost two decades. And that revolution was evident in 2015. From that quest, Google updated its algorithm in 2013, with Hummingbird and later on in 2015, AI (in the form of Natural Language Processing) became a major factor for search with RankBrain. You may think this is pure keyword matching, but it is not. The old SEO says that if you want to be successful at ranking your site you got to have backlinks, keywords and optimize for those. Those basic tactics still work. Indeed, the backbone of the web got built upon backlinks. How do you make your SEO strategy effective in an era where NLP-powered search algorithms can read human language independently from keywords? First, this process is more like a transition. Therefore, even though keywords still matter they are becoming obsolete. When is this happening? Hard to say! That will probably also depend on how fast voice search will take over, which will speed up the process as people will start interacting in natural language rather than keywords with those digital assistants. Proper structured data in your news, blog, and sports article page can enhance your appearance in Google Search results. Enhanced features include entry in a top stories carousel and rich result features such as headline text and larger-than-thumbnail images. By structuring your content according to this guide, your content may be automatically turned into an action on the Google Assistant. There are tremendous implications for that. First, you can’t think any more of SEO as single and isolated “tricks” or tactics. That is something that great SEO experts already knew. But now this needs to be clear to everyone looking to implement advanced SEO strategies today. Third, you need an entity-based content model based built upon a sort of barbel strategy. On the one hand, short, conversational and voice-ready content. On the other hand, long, detailed content. The short content will be used to address specific questions, to make it ready for voice search. In short, that is how you make your SEO strategy holistic. You also need a rigorous process of SEO Hacking if you want your site to gain traction, quickly. Those things together can help you reach the top of Google‘s search but most importantly get ready for voice search. This kind of approach – the entity-based content model – has been developed together with the WordLift team for whom I’ve been involved as a Business Developer. WordLift is a software that uses AI in the form of NLP to enhance on-page SEO and assist SEO experts to transition toward a future where RankBrain became a primary factor for Google’s search algorithm. From a superficial look, those might seem like three separated aspects of SEO. However, that is not the case. In fact, with a proper Semantic SEO strategy, you can target them all. Before we get to more advanced strategies, let’s cover some basics. Many who write online believe that Search Engine Optimization (SEO) is something too complicated to handle. That is why they give up before even figuring out what is SEO and how it works. However, I want to show you a practical way to use a few free and simple tools to use right now to master the basics of SEO copywriting. Those suggestions you get is called Google autocomplete. That feature is quite useful for a few reasons. First, it helps you complete the search by suggesting you valuable things. Second, it saves you time. Third, it also gives you new ideas about things you might not have thought about. That is from the user standpoint. What about who writes content? Well for those who write content Google autocomplete feature is even more useful. In fact, those suggestions are queries or questions that users frequently ask Google. That is why they are getting featured as autocompleted results. Those two tools are all you need to pick a topic, title and the right keywords for your next copy. In fact, that is Big Data Google is giving you about your target audience. That is also all you need to understand the basics of SEO copywriting. It is critical to writing about something you’re passionate about. Yet if you’re writing for business, you need to find an audience first. How do you see that? Simple, look at Google’s autocomplete. In fact, those are frequently asked questions, which means there is an audience for that specific topic. In fact, we all use Google mostly to solve practical issues. Therefore, with the autocomplete, you can figure out whether there is an audience for the article you’re about to write. The first suggestion “Why is Google the best search engine” seems excellent as the topic of your next piece. Journalists know the title is a crucial component of the whole piece. Therefore, you might want to spend time understanding what title to use for an article. One kind of claim that works pretty well for business content is that title that addresses a specific pain point of the users. Where do people show their pain? On social media, for sure they don’t. Once again, Google is the place, and the autocomplete is the answer. The Headline Analyzer gave a score of 72 out of 100. That is pretty good considering I’ve never had a score higher than 76. I wouldn’t focus too much on the number, but I believe from 70 up the headline shows great potential. We have the title; now we need the right keywords. How do you do that? Most people that write online fear SEO, because they believe that is too hard, or that they need to know sophisticated search engine optimization techniques. That doesn’t make sense at all. First, if you think of SEO is about gaming Google‘s algorithm, you got it wrong. SEO is a set of insights that you have about what people look for through Google. In short, you can uncover data about your potential readers, and customers with the utmost simplicity. In fact, SEO doesn’t have to be complex at all. For instance, now that we picked a topic and a title, we can find some keywords users are typing into Google related to the topic we’re about to write. How? Simply by using Google‘s suggestions. These questions even though usually have a way lower volume compared to simple keywords like “SEO” they are also more specific and address an issue the user is having at that moment. Therefore, those are transactions. That is how you get questions users frequently ask, to include in your copy to address real doubts your target customers might have. That’s it. A little caveat: the purpose of this article is to show you the findings of my experiments. I try to test things, not in the sense of gathering data but rather to do simple experiments with a low probability of succeeding. When one of those does succeed; for me the signal is clear. There is something in the experiment that Google liked. I can’t say exactly why and what. But that doesn’t matter. As long as you follow the steps I’ve taken chances are you’ll also get similar results. I intended to target a long-tail keyword with low search volume and competition and see if I could trigger a featured snippet. Once and if the featured snippet would have been triggered. I’d wait a few days and then test whether that also triggered a voice search from my Google assistant. That is what I did, and it worked! Going from the featured snippet to voice search is not automatic. 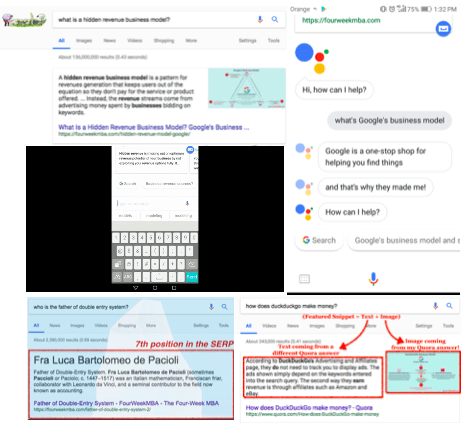 Backlinko recently analyzed over 10,000 Google Home search results, and it found that 40.7% of all voice search answers came from a Featured Snippet. Of course, thinking about a fixed percentage might be deceiving as Google continuously updates its search algorithm. Also, voice search is so new that it’s hard to say how it will evolve in the next months. Yet as of now a featured snippet is a powerful way to get into voice search, that is also why I like a strategy based on targeting for the Google‘s featured snippet. Above you can see a summary and breakdown of five critical aspects. In my editorial strategy, you’ll see that in some cases I divide up the title of an article in two parts. The first part is usually a question. In fact, the purpose of that question is to target a featured snippet. However, this one was way more competitive as the featured snippet was already taken by Quora (as you might imagine Google trusts Quora way more than a small blog like mine). However, not all is lost. Thus, I had already an answer to that question on Quora. So I used the infographic I had produced for my article, and I added it to the same question on Quora. My reasoning was simple. First, the question that was ranking first on Quora and that Google was using as featured snippet didn’t have any image inside. So why not try to see whether I could trigger a featured snippet by signaling Google that my answer was more comprehensive as it comprised the infographic. Second, by positioning my content on Quora, I was also trying to signal to Google that the same content coming from my blog could be trusted. In short, I was trying to use Quora as a vehicle to bring credibility toward my blog. Something interesting happened. The day after I had repurposed my content over Quora. When I typed on Google the question “how does DuckDuckGo make money?” it triggered the old featured snippet. This time though, while the text was coming from the old answer; the image was coming from my answer (which includes a graphics I had inserted inside). Even though I didn’t manage to steal the featured snippet; I still managed to position my image inside the featured snippet. In short, I believe since the text answer from Quora didn’t provide any graphics. The search algorithms pulled it out from mine. In other words, Google‘s search algorithm is smart enough to split the featured snippet in half: text and image. Remember the purpose of the featured snippet is to give a direct, short answer to users for questions. Further, the goal is to provide relevant content that can quickly answer, be it text or an image. From the data above you can see that also search results that are at the 4th or 5th position have chances of getting the featured snippet. This is important because if you do get it, then you’ll steal traffic from the first position. As pointed out by the same study, when a search result is ranked first, and there is no featured snippet, it gets 26% of the traffic for the overall query. When instead, there is a featured snippet on that page the first result only reaches 19.6% of traffic. In other words, the featured snippet steals traffic from the first positions. Even though my result was in the 7th position in the SERP (therefore according to ahrefs.com study it only had 0.7% of chances of getting snipped) it still triggered a featured snippet. Thus, control my brand through Google. Therefore, I set up a page for the scope and used a strategy that I explained in this article. This SEO experiment is important because usually a featured snippet of a person is triggered either when there is a Wikipedia page that supports it. Or the site from where it’s coming from has high authority. Yet I wanted to see whether I could do that with my small blog based on the quality of data I provided to Google. In this particular case that is pulling up information about me taken from an author page, I have on Amazon. In short, it seemed like the work I’ve done for the featured snippet (Schema and Open Linked Data might have been the most significant contributors) had also triggered the knowledge panel. Like in a poker game where there are winning hands. If I had to compare featured snippet to knowledge panel; I’d say the featured snippet is like having a four of a kind. Instead, the knowledge panel is like having a straight flush! In fact, today if you look for “Gennaro Cuofano” you’ll only see that box on the right side of the search box (that is the knowledge panel). As we’ve seen the knowledge panel has a different purpose than the featured snippet; while the featured snippet aim is to answer a specific question. The knowledge panel gives relevant information about a business. The featured snippet is way more fluid and based on rankings; the knowledge is based on the ability of the information you’ve provided to enter Google’s knowledge vault. While there is no sure way to trigger a knowledge panel; getting a featured snippet might facilitate it. When the knowledge panel cannibalizes the featured snippet that is a good sign – I argue – as this implies that Google might be trusting more your data. Therefore, over time Google‘s knowledge panels might consolidate around websites like Wikipedia, Amazon and so on. In other words, for some queries, Google prefers to give a result in the form of a featured snippet. If users want to see the other search results they have to voluntarily click on “show all results.” This seems to be an important change as for the first time Google is hiding its results page. Yet now the question comes naturally: Will Google cannibalize content from the SERP? Is going getting into the content business? Well, I thought what a better way to solve the impasse than to ask Google itself. If you think about it – I argue – it’s all about its business model. If the business model fails, then the company doesn’t exist anymore. Now, “one-stop shop” means that users can get all they need right there, on that blank page. Thinking about how Google has evolved in the last years. There is no doubt that Google needed third-party websites – it still needs them – to offer relevant content to its users, besides paid ads. Imagine a web filtered through Google where all you got was a bunch of paid ads. Who would have found that interesting at all? Instead, when Google introduced its paid network for publishers (AdSense), this allowed any site to monetize their content quickly. As anyone – that deals with Google – knows, the search engine from Mountain View loves content. This spurred the birth of a content industry on the web, which main aim was to feed as much web pages to Google. The deal – although implicit – seemed to work quite well. Google got “quality content” from third websites. It allowed them to monetize it; while those websites remained the intermediaries between Google’s users and Google itself. This deal made sense for anyone. In fact, Google didn’t have enough power to produce content itself. However, starting 2012 Google has introduced a set of initiatives (Knowledge Graphs, Hummingbird, and RankBrain just to mention a few) that made it way smarter than it was. Those initiatives allowed Google to gather content around the web, converts it into data, which can be easily manipulated to create new data. That data, in turn, can become content, served to its users. Thus, if Google can produce that content itself? Would it still make sense to show search results coming from third-party websites? The question remains open. It’s too early and too hard to say what will the future hold. There are a few considerations to make though. First, if we look at AdSense compared to AdWords. There is no doubt that the former help fuel the latter. However, it is true that Google shares most of its revenues with AdSense partners. That is also why AdSense has such lower margins compared to AdWords. Thinking business, if I were Google, I’d try to focus on the part of the business that has high margins. Second, Google has no control over third-party websites part of AdSense. As a company that wants to be a one-stop shop, it also makes sense to have as much control over its content. Thirds, today for Google might be cheaper to index the visible web and give back search results. But what if it becomes cheaper to create its own content? Imagine how much resources would Google save in terms of crawling budgets, and spamming controls. Another little caveat: featured snippets are volatile as they depend on ranking and other aspects that Google might take into account from time to time. Thus, some snippets that appeared at the time of this writing might have disappeared. However, the overall strategy proved to be successful, at least in the short run. In fact, the objective isn’t just the featured snippet but the knowledge panel, which is usually way more stable over time. Yet, one and the other might often be connected if in you use a Semantic SEO strategy based on structured data and open linked data. As you can see even though the number of total impressions deteriorated by 18% (from 31,170 impressions down to 25,525). On the other hand, if we look at total clicks, they went up by 6% (from 521 to 554) in the last 28 days. In addition, the average CTR (click through rate) has increased from 1.52% to 2.17% (this is a staggering 42% increase). Also, the average position of my keywords on the SERP increased from 47.8 up to 45.9. If we look at the numbers in absolute terms, they might seem small. Yet, if we take into account the % increase that is not bad at all! Imagine this kind of metrics improvement for a large site. On those keywords the volume is low. Yet as of now they seem to have a good click-through rate. Of course, numbers are still too small to draw any conclusion. However, It will be fun to see how traffic coming from those keywords will evolve over time. For me, it was an SEO experiment, but of course, now that it worked it is also a good business card to have. Why? First, I was able to have it based on a web page of my site. That rarely happens. In fact, most times when it comes to people, Google only offers a featured snippet if you have a Wikipedia page or an authority website. In short, Wikipedia has such an authority in Google‘s algorithm eyes that it will take it for good and offer it as a snippet. Even so, if you’re a person, unless you’re a public person there is no way Google is going to use that information in a featured snippet. At least that is what I thought before of this experiment! For the sake of this discussion I’m also going to mention how I used WordLift (the company I currently work for) to hack my personal branding. Gennaro is a digital entrepreneur specialized in growing online businesses. He launched and created FourWeekMBA.com. He holds a Law Master’s Degree and an International MBA from LUISS Business School and the University of San Diego. In San Diego, he worked as a financial analyst for a real estate investment firm. Now Gennaro is a Business Developer for WordLift. You might notice how I avoided story-telling, kept it short and biographical. That leads to the second point. That will make it easier for Google to understand that you’re targeting that specific question, thus improving your chances to get the snippet. Although Google makes a case for using structured data for recipes, we now know that structured data is crucial also to rank any other kind of page. In other words, with structured data, you do Google‘s little crawlers job easier to index and rank the page easier. How can you implement structured data? With a vocabulary called Schema.org. In short, Schema is the most efficient way to translate the content on that page as data that Google can quickly process. That is why I used WordLift to create a page and set that up as a schema type “person.” In fact, that is a particular property of Schema.org that allows Google to understand what the web page is about. I then used an additional field to link my page to all the other pages about me on the web. With this setting, you will create an entity, or a defined object now existing on the web. It is almost like Google finally knew I existed. To make that page more relevant connect it to other key pages of your site. For instance, if you have a few articles that are ranking pretty well use them to create internal linking toward your page. To make sure that page becomes authoritative for Google you need a bit of backlink. How do you get them? One effective way is to use that page as a bio to link when writing guest posts for other sites. Getting a featured snippet isn’t only about getting leads but also building your brand through Google. For how unconventional that might seem Google is the ultimate source of authority. Therefore, that is the best business card you could ever present to anyone. I’ve been dealing on a daily basis with advanced SEO strategies as part of the WordLift team, in the last year and a half. In addition, I use SEO Hacking as a process to gain traction over larger publishing outlets. A few months back I was looking for some quick and free Google Chrome extensions I could use to have a quick glance and an overview of any website. As I talk to dozens of people on a weekly basis to consult on SEO related issues I’ve developed my swiss knife for SEO. This comprises mainly five Google Chrome extensions that I’ve been using on a daily basis for the last years. Over the dozens of extensions I’ve been trying out, those have stuck with me, and I believe that if you are an SEO professional or on the road to be one, those extensions might help you out. Of course, those extensions are meant to give you a quick glance; an overview of any website you’re looking at. Those are not meant as a substitute for a proper analysis. In fact, for a more in-depth analysis, you’ll need to check your data and cross-reference it. However, for a quick glance, those tools are quite useful. If you’ve been following how Google has been evolving in the last years. You’re aware that since 2012 it has been building up a so-called knowledge graph. In other words, Google is organizing the information on the web to have it become knowledge. This knowledge graph is built on top of triples, which are simple phrases (that comprise a subject-verb-object). Those triples are organized in data, which is called structured data. Just as humans use language; nowadays search engine use structured data to talk to each other. With the OpenLink Structured Data Sniffer Chrome Extension, you can see the structured data present on any web page. For instance, in the case above, you can see how with WordLift I automated the process by adding critical information about my website and the web page in the form of JSON-LD, a format that Google likes to understand web pages. Why? Because this format isn’t affecting the performance of the page and it is allowing Google bots (the crawlers that go on a web page to extract critical information to index a web page) to have rich data about the web page. The app shows you right away with a small icon on your Chrome Browser what CMS the website is using. Also, if you click on it, you’ll also have a more in-depth analysis of plugins and tools used by that website. This is by far the fastest way to assess what CMS any site is using once you land on them. You will see the data related to a keyword you type in the Google search box. You’ll also get a box on the right side that says “people also search for” which shows you all the related keywords with volume, CPC, and competition. The data seems to be pretty reliable, and I’ve been using it in the last months with great pleasure. In fact, the quality of data from SimilarWeb depends really on several factors. In general, it is a great tool to have a quick glance at any website. In my opinion, the app is getting better and getter. Here the same caveat I did for the SimilarWeb app. It is an estimate which is not supposed to substitute a rigorous analysis but to have a quick glance of any website, in a matter of instants!